Punjab Vidhan Sabha Recruitment 2019: Punjab Vidhan Sabha has invited applications on prescribed format to fill the posts of System Analyst, Computer Operator, Safaiwala, Peon and other. 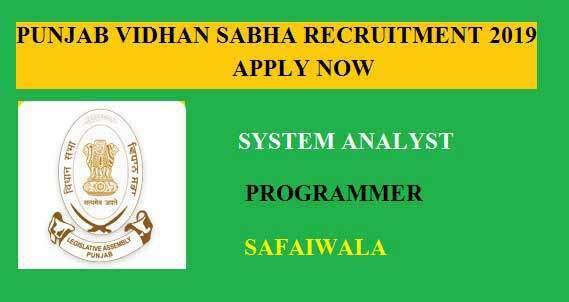 Candidates fulfilling the eligibility criteria can apply for the Punjab Vidhan Sabha Jobs 2019 through offline mode. For more details please, read the notification given below. ਪੰਜਾਬ ਵਿਧਾਨ ਸਭਾ ਦੀ ਭਰਤੀ 2019 ਲੰਮੇ ਸਮੇਂ ਤੋਂ ਪੰਜਾਬ ਵਿਚ ਸਰਕਾਰੀ ਨੌਕਰੀ ਦੀ ਤਲਾਸ਼ ਕਰ ਰਹੇ ਯੋਗ ਉਮੀਦਵਾਰਾਂ ਲਈ ਇਕ ਬਹੁਤ ਵਧੀਆ ਮੌਕਾ ਹੈ. ਭਰਤੀ ਸਬੰਧੀ ਨੋਟੀਫਿਕੇਸ਼ਨ ਅਨੁਸਾਰ, ਯੋਗਤਾ ਦੇ ਮਾਪਦੰਡ ਨੂੰ ਪੂਰਾ ਕਰਨ ਵਾਲੇ ਉਮੀਦਵਾਰ ਪੰਜਾਬ ਵਿਧਾਨ ਸਭਾ ਭਰਤੀ 2019 ਲਈ ਅਰਜ਼ੀ ਦੇ ਸਕਦੇ ਹਨ. Candidate should be Post Graduate in Computer Applications/Information Technology/Computer Sciences/Computer Engineering/Computer Technology in First Class from a recognized University with an experience of five years in Teaching/Industry/Research Institute/Software Development/Government orgnisation. Punjabi up to Matric standard is essential. Candidate should be Post Graduate in Computer Applications/Information Technology/Computer Sciences/Computer Engineering/Computer Technology in First Class from a recognized University with an experience of three years in Teaching/Industry/Research Institute/Software Development/Government orgnisation. 1. The candidate should be Graduate from a recognized university. 2. Six months certificate course in computer applications with 30 w.p.m speed in English and Punjabi typing. Application/information Technology/Computer Science/Computer Engineering/Computer Technology from a Recognized University. The candidates have to qualify Punjabi and English Typewriting test at the speed of 30 words per minute. Candidate should be Graduate in Computer Applications/Information Technology/Computer Sciences/Computer Engineering/Computer Technology in First Class from a recognized University. 10+2 from a recognized institute. Punjabi up to matric standard is essential. Graduation Degree, Fluent in English/Hindi/Punjabi and Punjabi up to matric standard is essential. Candidate should be Graduate from a recognized university. Upper Age Relaxation is Applicable as per the Government Rules. Please read the official notification before filling application form.